In the first months of 2008 Jewish Clevelanders were vigorously debating the question "Should the Jewish Community Federation's new headquarters be built in an eastern suburb such as Beachwood, center of the Jewish population and near most Jewish agencies, or downtown to show a continued commitment to the city?" To inform the conversation we described the first eight locations, starting in 1903, all rented, and then in 1965 its own building at 1750 Euclid Avenue. They were all downtown, though the community lived to the east and kept moving eastward. The Federation decision of September 11, 2008 hoped to satisfy all by: 1) creating offices in Beachwood, and 2) continuing to use 1750 Euclid Avenue downtown. This page describes the decision with four documents: the report of the Building Committee; the email from Board Chair Harley Gross; and the newspaper accounts on September 12 in the Plain Dealer and on September 19 in the Jewish News. As for the implementation of the decision, two weeks after the decision Federation bought an office building in Beachwood. In August 2010 all employees moved there (see Mandel Building below), leaving vacant the old headquarters at 1750 Euclid and also 1720 Euclid, owned by Federation. The two downtown buildings were sold in July 2015 and have just been demolished. In a most welcome gesture of transparency, the Federation website displayed a link to the September 3, 2008 report of its Building Committee. We show below only the first four of its six recommendations. To read the entire 16-page report, an Adobe pdf document, click here. The report also recommended purchase of an existing structure as preferable to new construction and then described in some detail the former Lamson & Sessions building on Science Park Drive which Federation would purchase later that month. The day after the decision, thousands of Jewish Clevelanders received an email message from Federation Board Chair Harley Gross. His report of the decision mentions keeping the 1750 Euclid Avenue building first, and describes the Beachwood building not as headquarters, but "to house operations". The compromise - to have both a downtown presence and a move to Beachwood for operations - is seen as a "win-win" outcome. His message ends with a call for unity, for this had been a decision that could have divided and weakened the Jewish community. Beachwood – The Jewish Community Federation of Cleveland will pull the bulk of its operations out of downtown and staff a new office in the eastern suburbs, ending a 105-year tradition of locating its headquarters in Cleveland. After months of fevered debate, members of the federation's board of trustees voted 77-37, with one abstention, Thursday night to buy an office building in Beachwood. Federation leaders, who avoided using the word "headquarters" afterward, described the new location as an expansion of its operations. They said the federation will retain its office building at 1750 Euclid Ave., use it for meetings and yet-to-be-decided programs and keep four or five people working there. Meanwhile, 97 percent of the federation's 130-person staff will report to work in Beachwood. Members of a pro-downtown coalition of Jews expressed bitter disappointment. "I think the move is wrong," said S. Lee Kohrman, the founder of a downtown law firm, as he left the trustees meeting. "I think the Jewish community is a subset of the general community. Ultimately, it will grow only as the city grows." Kohrman and other members of the Committee to Keep the JCF in CLE urged the federation to reinvest downtown. They said a vibrant new headquarters near Playhouse Square could help to revitalize Cleveland and attract young adults to an aging Jewish community. Leaders of the federation, the chief fund-raising and planning agency for the region's 82,000 Jews, said its offices needed to be closer to Jewish households concentrated in the eastern suburbs. In the end, their pragmatic arguments swayed the board. "It was a difficult decision," said Ronald Ratner, a trustee who led the committee that recommended moving operations to Beachwood. "It touched people's core values." "I think it's a difficult but right move," said trustee Fran Immerman, a Moreland Hills mother of three. The federation trustees met for two hours in closed session at the Jewish Community Center in Beachwood. Participants described a lively, civil debate. A motion to table the issue was defeated. Afterward, federation leaders could be seen congratulating one another. They carried the board by a more than 2-1 ratio. 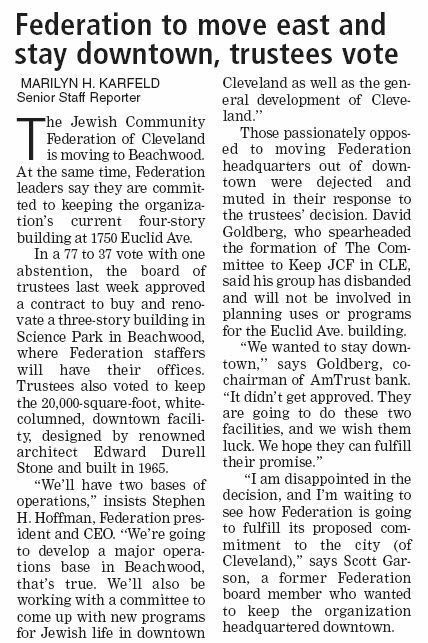 "This was a win-win, both for the city of Cleveland and for the Jewish community," said board chairman Harley Gross, who argued for the Beachwood facility. "It will allow us to deepen our relationship with our donors and with our volunteers." He said that the federation will introduce new programming at its downtown building and that he will soon appoint a committee to determine what that programming will be. As they gathered later at a downtown restaurant, members of the pro-downtown coalition talked of a crushing loss for the city they love. The federation, founded in Cleveland in 1903, is the city's last major Jewish institution. Marilyn Karfeld, a senior reporter on the Cleveland Jewish News staff, interviewed Federation leaders on the morning of Friday September 12, right after the decision of Thursday evening. This news was published in the next issue of the Cleveland Jewish News, which was Friday September 19 The story's frankness in voicing the disappointment and skepticism of those who favored staying downtown shows the independence of the Jewish News from the Jewish Federation. Those who advocated for a continued Federation presence in Cleveland have kept their word to move on. On September 18, 2009 the Jewish News reported a $16 million gift to the Jewish Federation from Jack, Joseph and Morton Mandel. It would cover the $7.2 million cost of the Beachwood building, plus construction, equipment and "soft" costs. In 2009 its occupants moved out and major renovations began. On Monday August 2, 2010 all Federation employees would be at the new headquarters on Science Park Drive. On August 10, 2010 Federation's new home was dedicated, named the Mandel Building in honor of the family whose splendid gift had paid for its purchase and renovation. Read the Federation announcement. The three story building, constructed in 1982, has 65,000 square feet and is on 4.5 acres of land.